I'm loving every single minute of my shawl. 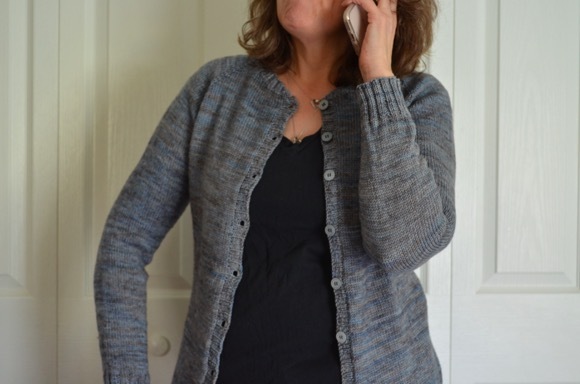 The pattern is laminaria, many knitters have made it and now I can be included in the many. I'm on the last chart and have about six rows to knit, they take forever now over 20 minutes. And yes, I am still wondering if I'll have enough yarn or will I have to improvise the ending? Stay tuned...I'm sure I'll think of something if there's a need. Still reading Sing You Home by Jodi Picoult and it's okay. It's predictable and it seems the author threw in every controversial topic into the plot. Yesterday I picked up another Anne Lamott book who I simply adore reading. She never disappoints and this book I'm sure will entertain me and move me spiritually. I can not wait to see you shawl once it's blocked Karen, it is going to be an heirloom piece. I adore Anne Lamont too, thanks to you, so I will have to look for this book to add to my stack. gosh that shawl is gorgeous!!! can't wait to see it DONE....and you are sooooo close!!!! I didn't blog about my reading book (only my listening one!) ---reading the Interestings. Just started that one, too, but so far, I'm liking it. I HATE when they are predictable....and forced. I'll keep you posted on this one! You must be really proud of yourself Karen it is gorgeous. I haven't heard of Anne Lamott, an excuse for a quick google search. Enjoy the last few rows.It's great that you've loved making it so much. Oh forgot to answer your question, I'm making a La la's simple shawl that I saw over on Lori's blog an still reading 'Things I've been Silent About 'by Azar Nafisi, which is very insightful. It's beautiful! I can't wait to see it. It's incredible- the color and texture is simply divine Karen...gee it even matches the cover of your book. What a beautiful shawl this is- will be. I love the color!! It's going to be so gorgeous when it's done. I read one Picoult and it seriously dissapointed. Lamotte? Always good for the soul. I hate the feeling of not knowing if you have enough yarn. I think I go through it on most projects! I am anxious to see it off the needles and blocked. I'm sure it's going to be gorgeous! that shawl looks amazing and the color is perfect!! Can't wait to see it blocked and done...another gorgeous shawl for you to wear!! 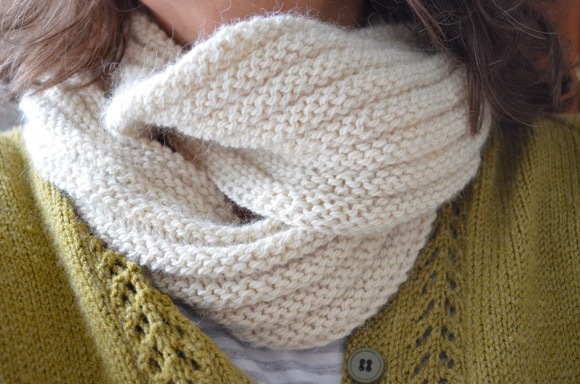 Your shawl looks like lots of little bubbles of sunshine, how fun to be knitting this gorgeous project. I hope you have enough yarn to finish. This looks like it is going to be a beauty! 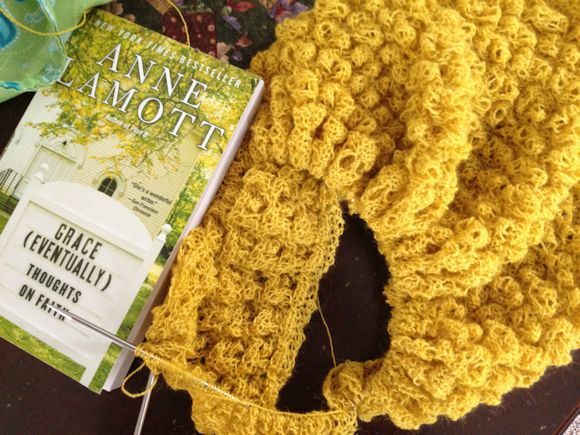 Beautiful shawl and yes, you can't beat Anne Lamott :-). I LOVE that color. It will be stunning this fall! I LOVE Anne LaMott! She is one of my very favorite writers ever. Beautiful shawl! Waiting for this finish ! I adore the yellow!!! Jodi Picoult's books I've not enjoyed of late and tend not to read any more, but I do sometimes wonder if I am missing out on something thanks for confirmation that I'm not. that shawl is looking wonderful. :) can't wait to see it all completed. I am knitting Gansey hats and modifying a Rav pattern. I am reading a book about Sally Hemmings who was Jefferson's lover and slave. Its 800 pages and each sentence requires a bit of time to digest it. I hope to finish it THIS fall. Oh that is beautiful Karen! It reminds me of Forsythia in the spring - my favorite!! I love that shawl color!! I have not been reading since I finished "The Weed That Strings the Hangman's Bag". Perhaps I'll pick something up this long weekend! all the best. Your shawl looks ever so soft and pretty. The shawl looks so pretty and you can almost see how soft the yarn is. I need to look through all the beautiful things you've knitted, maybe that'll help me get my knitting mojo back. What a sunny yellow! Beautiful, friend! Wow, those rows must seem a little bit endless sometimes.. I can't wait to see it finished!! Your shawl looks amazing, cannot wait to see it when it is blocked, it will be a show stopper. I am currently reading the same book and I would agree, it is quite predictable and IMO very unlikely series of events. Hope you have enough yarn, Karen! The shawl is going to be beautiful. I'm also working on a Jodi P book, Second Glance. It's kind of weird. Anne Lamotte is a wonderful writer, I agree! Might have to find that one. Great color for your shawl, can't wait to see it when it is done!! Oh Anne Lamotte is one of my very favorites. I am reading The Rules of Inheritance by Claire Bidwell Smith. Lovely. And I love the color of that yarn! and that yarn color - you MUST tell me what it is. alas, the name of the color is: L2040-not very original is it? The yarn is Manos Lace and I highly recommend it. Looking forward to seeing the finished shawl. What a lovely sunshiney colour. I've not joined in yarn along for a while, I was knitting something secret for my Dad for a gift so I couldn't show it and I'm knitting several baby washcloths which are all similar and not very exciting. I am looking forward to getting stuck into some 'proper' knitting again soon!